There are days when you just want to let yourself go and forget about diet and just give in. And this weekend, that’s just what I did. Sweet freedom! I tried this a second time and I still think it’s a ‘hyped’ version of cream-filled lady fingers. Hot chocolate mint drink on a rainy Saturday. I am a certified caffeine junkie and I’ve recently discovered some cheap coffee treasures at the supermarket. Cappuccino for just P8.00 and it comes with chocolate powder too! These other cheap coffee fixes can be had for less than P10 each and they are surprisingly good too, hot or cold. With the super hot weather now, I love it iced. So do the math, a grande iced cappuccino at coffee shops cost around P130. You can have more than 13 of these for the price of one. Nescafe Gold retails for around P47 for a pack of 5; while Trung Nguyen G7, the famous and delicious Vietnamese coffee, retails for around P72 per box of 10. A neighborhood supermarket sells this by piece, which is a good idea for people who want to try it first. Believe me, this tastes good! I am a certified caffeine freak and I love Starbucks (and Coffee Bean, Seattle’s Best among others) and what better way to celebrate their 40th anniversary last March 8 than to give free upsize? Yay! So I drowned myself in my ever favorite Espresso Frap. Love it! And they launched their new wordless logo too. Just like any change, I’m sure there are commotions and violent reactions over it. People have identified with the old logo already and it takes a while to get used to the new one. I’m thinking maybe it’s their way of making the logo speak for the brand; like when people see the mythological siren, people will associate it with Starbucks. But what do I know? So…. I will just enjoy my coffee and let the others whine over the change. sips my coffee… this is life! Starbucks Glorietta 5 is now open. You can use your coupon (if you have the planner) here! 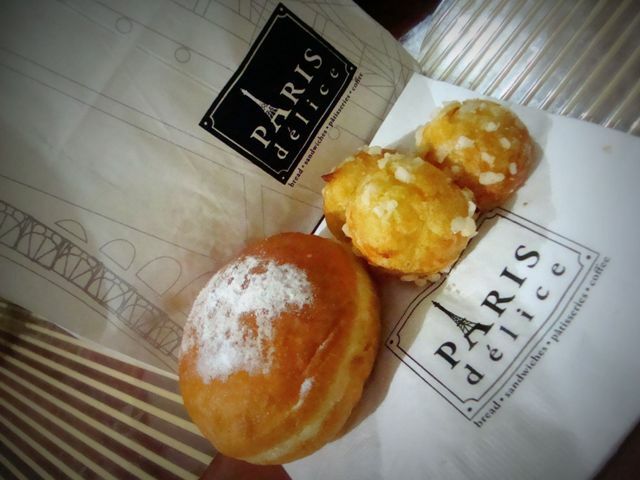 Paris Délice is worth dropping by for its delish breads and pastries. Whether for breakfast, lunch, snack or coffee bonding, you will not regret braving the often busy street of Makati Avenue just to grab a quick bite at this quaint pastry shop. Their best-seller is the Chocolat Beignet (P85), which oozes with rich delectable chocolate with every bite. My brother is not a fan of chocolate but he easily wolfed this one down. Croissant and the pastry that looks similar to the cream puff we know are good too.